ICYMI: Ricky Skaggs Wows at "The 52nd Annual CMA Awards"
Billboard Declares Skaggs' Star-Studded Tribute as Evening's "Best Performance"
Nashville, Tenn. (November 16, 2018) — At "The 52nd Annual CMA Awards" Wednesday night in Nashville, freshly inducted Country Music Hall of Fame member Ricky Skaggs was honored during a special tribute with the country and bluegrass music legend front and center. At Country Music's Biggest Night™, the eight-time CMA Awards winner was spotlighted with a star-studded medley that Billboard declared as the evening's "best performance." The tribute opened with Skaggs and his band, Kentucky Thunder, tearing into bluegrass classic, "Black Eyed Suzie." 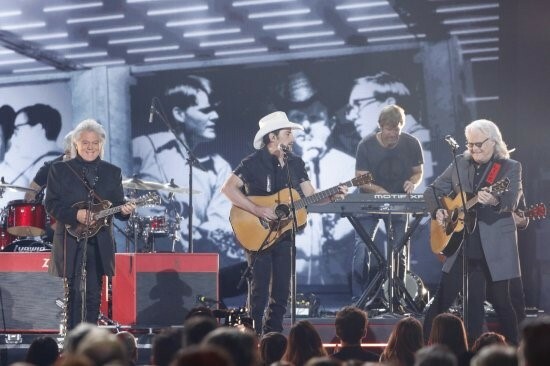 Skaggs then joined 2018 CMA "Entertainer of the Year" Keith Urban and John Osborne of Brothers Osborne, pickin' electric-style through his 1983 chart topper, "Highway 40 Blues." 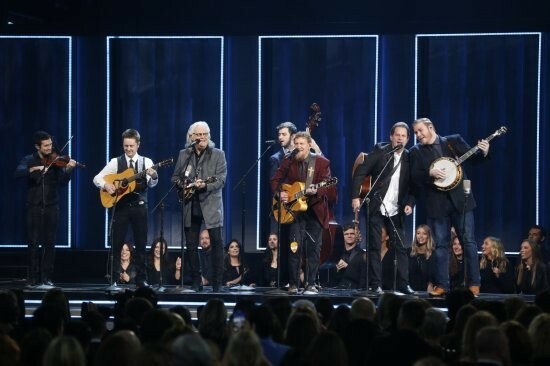 Skaggs then hitched up with Brad Paisley on electric guitar and Marty Stuart on mandolin for a rip-roaring performance of the 15-time GRAMMY® winner's 1985 No. 1 hit, "Country Boy." Youngsters "Fiddlin'" Carson Peters and Sierra Hull also joined in for what Taste of Country calls, "pure musical genius." "I can't explain what all I felt Wednesday night, but when I saw industry people standing up all over the place for 'Black Eyed Suzie,' it was like bluegrass music had been justified!" notes Skaggs. "It wasn't about me, or my great band Kentucky Thunder, it was truly about the music itself. I was incredibly thankful for that. I think Mr. Monroe was smiling down from Heaven." "The 52nd Annual CMA Awards," hosted for the 11th consecutive year by Paisley and Carrie Underwood, was broadcast live on ABC from Nashville's Bridgestone Arena. Earning 12 #1 hit singles, 15 GRAMMY® Awards, 13 IBMA Awards, nine ACM Awards, eight CMA Awards (including Entertainer of the Year), two Dove Awards, the ASCAP Founders Award, three honorary Doctorate degrees, inductions into the Country Music Hall of Fame, IBMA Bluegrass Music Hall of Fame, National Fiddler Hall of Fame, Musicians Hall of Fame, and GMA Gospel Music Hall of Fame, the 2013 Artist-In-Residence at the Country Music Hall of Fame® and Museum, an Americana Music Association Lifetime Achievement Award in the Instrumentalist category along with countless other awards, Ricky Skaggs is truly a pioneer of Bluegrass and Country music. Since he began playing music more than 50 years ago, Skaggs has released more than 30 albums and has performed thousands of live shows. He started his own record label, Skaggs Family Records, in 1997 and has since released 12 consecutive GRAMMY®-nominated albums. His latest release, Hearts Like Ours, with his wife, celebrated artist Sharon White of The Whites features the couple dueting on handpicked country love songs. And the Grand Ole Opry member has released his first-ever autobiography, "Kentucky Traveler." The book details the life and times of Skaggs and provides a descriptive history of Country and Bluegrass music, as told by the master himself. In addition to his regular touring schedule with his band, Kentucky Thunder, he has performed a string of dates with his better half Sharon White along with guitar legend Ry Cooder on the critically-acclaimed "Cooder-White-Skaggs" tour and from time to time hits the road with versatile singer/songwriter and pianist Bruce Hornsby on another critically-acclaimed tour, "Ricky Skaggs & Bruce Hornsby with Kentucky Thunder." Most recently, Skaggs has added Country tour dates as he plugs in and plays full shows of his chart-topping hits. The first "CMA Awards Banquet and Show" was held in 1967. The following year, the CMA Awards was broadcast for the first time – making it the longest running, annual music awards program on network television. The CMA Awards have aired on ABC since 2006. ABC is the network home of the CMA Awards and CMA's other two television properties, "CMA Fest" and "CMA Country Christmas."